Clement, the BTO Cuckoo, hatched from an egg in 2010. He never knew his biological parents and was raised by a foster family, successfully undertaking his first migration to Africa in the autumn of 2010. He first came to our attention in the spring of 2011, when he was heard calling on the BTO’s nature reserve in Thetford. On our first day of trying to catch Cuckoos, on 19 May 2011, we had a frustrating experience; neither of the first two birds trapped at Aldeby in Norfolk was large enough to carry a satellite tag. We returned to Thetford and decided to try the BTO reserve. We placed a stuffed Cuckoo on a pole in front of two mist nets and started playing our recordings of a male and female Cuckoo. Within minutes we had interest and it was not long before Clement was caught. We weighed him and, yes, he was large enough to have a tag fitted! Clement was a pioneer in several ways. Up until now, there has only been one recovery of a young bird that was found in mid-winter in Cameroon and that was 82 years ago. Clement was not only the first British Cuckoo to be tagged with a satellite-tag, he was also the first of our five birds to leave the UK. At sometime between the 2 and 5 June he set off on migration, a full month earlier than expected. It may prove to be that one-year-old Cuckoos such as Clement leave earlier than older adult birds but this was a surprisingly early start to his autumn migration. He continued his migration in short hops down through France and ended up on the Mediterranean coast of southern France. We expected that the birds would migrate through Italy and south into North Africa. In late June / early July three tagged Cuckoos were in northern Italy and we thought that Clement would head east to join them. It was then that Clement surprised us again. Instead of heading for Italy, he turned south-west and we next heard from him 650km away in Valencia in Spain on the 10 July. He was obviously keen to move and we next picked him up two days later on migration at 22:07GMT over the Mediterranean having just left Cabo de Gata. Two hours later he was 90km further along his journey and only 35km from the African coastline. He made landfall in Oran, Algeria (see http://www.panoramio.com/photo/36794319) and pushed on southwards. This was migration in action and something the early pioneers of bird migration research could only dream about. By morning (08:00) he was on the upper northern slopes of the Atlas mountains– the last vestige of vegetation before the desert crossing! The tag takes 48 hours to recharge between transmissions, so it was not until the morning of the 15 July that we picked up Clement, again in active migration over the Sahara desert. Instead of heading directly southwards across the desert, he took a longer diagonal route and flew south-west. 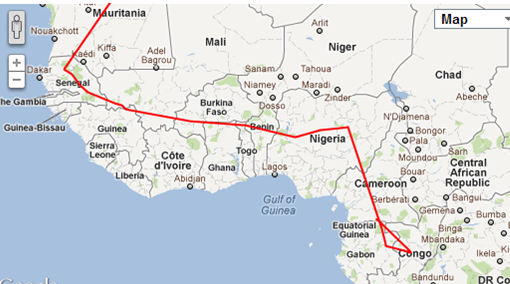 We tracked him for eight hours, in which he flew 400km, and he eventually ended up in northern Senegal on 20 July. This route down through West Africa was totally novel and in mark contrast to the three Cuckoos which took the eastern route through Italy. 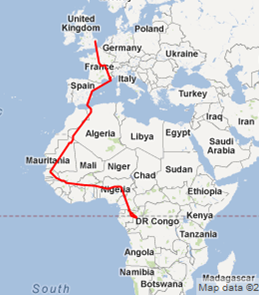 He then moved eastwards towards where the other Cuckoos were wintering in central Africa. After a prolonged stop in central Nigeria from late August to mid-November he moved to his final wintering area in Congo, having covered 3,200km (2,000 miles) more than the other Cuckoos that ended up in the same country! He started his migration back to Europe between the 10 and 18 of February, when we next heard from him in southern Cameroon, 450km north-west of his wintering location. At 19:02 on 22 February he was alive and the only subsequent message from the tag came at 07:57 on 25 February. There was no location information but the temperature sensor indicated that his body temperature had dropped from 36 to 22 degrees Centigrade, a sign that Clement was no more. We cannot rule out device failure but all the indications are that we have heard the last of Clement. 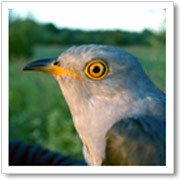 In the nine months over which we have monitored his progress, he has had the support of 206 sponsors and provided unique information about the life of a British Cuckoo. All maps (above) courtesy of Google Maps.